Nearly 150 years ago, the sport of roller polo was the most actively played and watched winter sport. Professional, semi-professional and amateur teams were numerous and each had their devoted following. 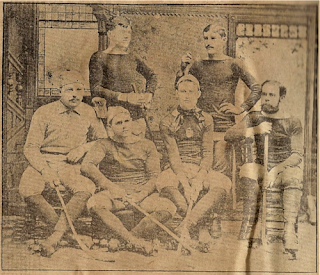 Particularly in the mid-1880s, Middleborough fielded a top-notch team, and three of its players would later play roller polo professionally, one of whom would achieve near celebrity status. Sadly, both the game and its players are largely forgotten today. Writing in 1957, Sampson McFarlin of Lakeville lamented that he found “few people under fifty years of age [who] know anything about [roller polo]. Some have never heard of it” [McFarlin, 1957]. Today, it is even less likely that people are aware of the former roller polo craze and the popularity of the sport, despite its similarity to modern rink hockey or hardball hockey. “It is as if the game,” wrote Keith Hogdon in Sports Illustrated in 1972, “had sunk without a trace. Gone now are the small wooden arenas heavy with smoke and the deafening noise of roller skates, the crunch of bone on hardwood and the rabid, rollicking crowds …. All that remain of those glory days are some fading memories, a few mementos and newspaper clippings” [Hogdon, 1972]. Without roller skating, roller polo would not have come about. The increasing popularity of roller skating in the 1870s prompted the local Middleboro Cornet Band to open a roller skating rink on Thanksgiving afternoon, 1879, in the Town Hall auditorium, proposing to operate it for a short time only in an effort to raise funds. As the band played selections, skaters would move across the wooden floor on their wooden-wheeled skates. The Middleboro Rink was an immediate hit, understandably so, as roller skating was then becoming a popular fad. Shortly after its opening, it was reported: "The skating rink started by the Middleboro Band is proving quite a success, being well patronized. This is a new way of getting a financial lift and shows the enterprise of the band." The following month, the rink was still thriving. "The skating rink still prospers, and promises well for quite a while yet. It has been successful beyond the expectations of any." Indoor skating was a recreation greatly in vogue among the Victorians. Not long after the establishment of the Middleborough rink, a similar indoor rink was opened in the Odd Fellows' Hall at Plymouth, in February, 1880, and the description of skaters there applied equally well to the scene in Middleborough Town Hall: The galleries were nearly full, and a good number of skaters upon the floor. The orchestra gave very fine music for all, and the graceful movements of two professionals with the awkward movements and tumbles of the novices, kept up the interest for the spectators. Some of our old skaters, who used to be artists on ice, found this kind of gliding a very different affair, and that it was as easy to make a spread eagle on the floor as it used to be for them to cut a pigeon wing on the ice. While many enjoyed the new pastime of roller skating, some found it too sedate and from this desire for a more active sport came the game of roller polo. Roller polo is best described as hockey on roller skates, though there were some key differences. Skaters would glide about the floor, "clubs" in hand, attempting to score goals on the other side. The game was fast and tough. It opened when a bright-red hard-rubber ball was dropped into a neutral zone, called "the spot," in the middle of the floor. On that signal, the opposing first rushes (forwards) skated from their own cages to the center of the floor, where there was a fierce battle for the ball with four-foot-long sticks resembling those used in field hockey. After one player gained control, play then proceeded about as it does in ice hockey for four 12-minute periods. Another race to the spot followed each goal, and ties were played off promptly by sudden death [Hogdon, 1972]. Initially, the game was played locally in the 1880s with six men (two rushers or wingmen, a coverpoint, a center, a halfback and a goalie) but by 1900 the coverpoint position had been eliminated. Fouls resulted from playing the ball with either the hands or arms or from deliberately hitting an opponent’s stick, and penalty shots were awarded for various infractions. Goal tenders were required to remain upright and could not stop a ball by falling upon it. When the goalie had to go one-on-one against a man with a hard shot in a noisy, smoky, poorly lighted building, he really strained for something extra. The ball was fired so hard and fast that arenas had nets above the boards to protect the spectators [Hogdon, 1972]. Roller polo shared with the later game of ice hockey a reputation for toughness. Grace Clark, who wrote pseudonymously as “Eve Lynn” for the Middleboro Gazette in the 1950s and early 1960s recalled an earlier episode with her husband, a shopkeeper in the Cobb, Bates & Yerxa grocery store and the goal tender for the Clerks team, whom she could not dissuade from playing polo at Christmas, 1901. …I didn’t want “Himself” to play that night. He was goal tender and that’s an awful position to play if it gets rough. Well he promised me faithfully he wouldn’t go …. Well, when I saw him again it was in the morning, “Christmas Day” and was he a sight. He had a black eye and his face was all swollen up, and when I asked him how he did it, he told me, “ran into the kitchen door that somebody left open”, and I, yes I believed him, for awhile, and then I began to think. He never got that black eye running into a door. And finally … “Himself” told me he played polo the night before and got hit in the eye with a hockey stick. I almost said it was good enough for him, but changed my mind and asked him who won? “We did”, was all he said. But right here I have the clipping saying his team did excellent work [Clark, 1960]. (Clark that night, in fact, broke the local record for most stops in one game -67). Naturally, all this rough play and rumbling across the Town Hall auditorium did the wooden floor little good, and the committee charged with the care of the building probably viewed the outcome of each evening's skating with dismay. Plymouth’s roller rink failed to last even a month before damage to the floor caused a suspension of skating activity until a new venue could be found, and the Middleboro Band apparently was faced with a similar dilemma. At the time that the rink functioned, Middleborough participated in the Southern Massachusetts Roller Polo League along with teams from Taunton, Providence, Pawtucket, Newport, Plymouth and Fall River. The fact that the town was able to match the teams of these much larger cities competitively was a testament to the talent Middleborough fielded in those days. New England, in fact (and Middleborough with it), was the center of the roller polo craze. So popular was the game that many believed that it would become the American indoor sport, the winter counterpart to baseball. In the early days of polo Middleboro had a crack-a-jack team and defeated all comers. It was in the days when six players constituted the team and the line up was [Eddie] Menard and "Mul" Smith rushers, Alfred Ellis coverpoint, Judge [Dennis D.] Sullivan centre, William R. Jones half back, and "Mike" Curley goal ["Meeting of Former Polo Players", Middleboro Gazette, January 31, 1913, p. 9]. Unfortunately, few if any records remain to detail the exploits of this team which was long remembered as Middleborough’s best. Perhaps because it also appears to have been among Middleborough’s shortest lived. After a few short years, the local passion for both roller polo and roller skating seem to have fizzled. 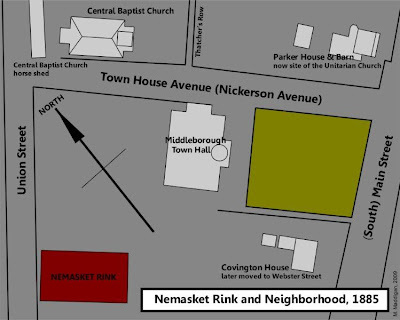 The Nemasket Rink fell into disuse and was sold for $375 in 1886. That winter, the rink was dismantled and its lumber, valued at over $2,000, was utilized to construct a factory building elsewhere in town. Following the disbandment of the local team, three of its stars - Curley, Smith and Menard - played professionally elsewhere. In 1895, Smith was playing for the Providence, Rhode Island, team where he "more than satisfied admirers of the lively game", and four years later he was with the Clinton, Massachusetts, team of the New England League. However, “Smith, who was known among the players as ‘Muldoon,’ whether or not that was his name, always had a liking for Middleboro and, when the polo season was over, returned to Middleboro to make ice cream” for B. F. Tripp on Center Street. Menard had what today would be considered a remarkably long career (he continued playing in the position as first rush for 30 years until his retirement in 1910) but which at the time was the norm for roller polo players. Curley's story, however, was perhaps the most tragic. A son of Owen Curley of Middleborough and a member of an athletically talented family, Curley had first played roller polo in the Middleborough rink. Apparently, it was his fist time on skates, for it was said that "at his first game he could not stand on the rollers and had to be assisted from one goal to the other by his team mates." Despite this, Curley adapted quickly to roller skates and he became the most noted goalie in the region. Following the dissolution of the Middleborough team, Curley continued to play the game professionally, being a member of, among others, the teams in Malden, Massachusetts (New England League) and Chicago. 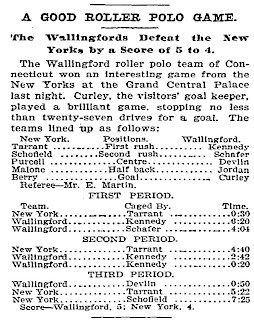 In 1898, Curley joined the Wallingford, Connecticut, team in the Southern New England League. At Wallingford "where he is doing excellent work", Curley served as captain – a recognition of his popularity, leadership, experience and prowess. “Curley was acknowledged as tops by the country over” and he was regionally recognized as one of the game’s greats. "He put up a fast game at the cage, however, and had played on teams in all the big cities, being recognized as the king of goal tenders. He had a record of 82 stops in one game." Sadly, in mid-January, 1899, Curley was found dead in his Wallingford room, "his death being due to a hemorrhage, the result of a blow from a polo ball." It’s not clear whether it was a single blow which killed Curley or whether his death was “brought on by stopping so many hard driven balls over his heart. That may have been so. Curley … wasn’t afraid of anything. He wouldn’t have dodged a cannon ball. The players did not wear so much protection as the goalie in modern ice hockey wears” [McFarlin, 1957]. He was just 40 years old. Following the demise of both the Nemasket Rink and the Middleborough roller polo team, the sport, not surprisingly, appears to have slumped locally. The town seems to have sporadically fielded teams, and equally intermittently associated itself with semi-professional leagues. In 1899, Middleborough was unceremoniously dropped from the Southeastern League, a consequence of a number of unspecified difficulties. At the time, the Middleboro Gazette reported that the team's association with the league "was all too brief to satisfy the lovers of sport in town, but there were handicaps from the start that could not be overcome." One of the handicaps that undoubtedly hampered the growth of the sport locally was the limited space in which Middleborough teams had to play. The venue used by Middleborough’s roller polo squads following the demolition of the Nemasket Rink was the American rink, located upon the third floor of the American Building on South Main Street. “When polo came along the stage [of the American hall] provided the high-priced grandstand seats. Along the sides were other seats. A chicken wire net around the playing floor was built to keep the spectators from being beheaded by the hockey sticks, or to lose an eye from a soaring puck. And inside the wire the American League players held forth. The game was exceedingly fast and attracted as many as the hall would accommodate” [Creedon, 1952]. In 1911, yet another regional league was proposed, this time to include Middleborough, Brockton, New Bedford and Taunton. "There has been a scheme of shop leagues, but it is thought to be better if the pick of the players is selected and one fast team put forth to represent the town". Apparently spearheading the movement for establishment of the league locally was Ben Chapman, manager of the American Rink. And although the initial proposal had been to form a local team comprised of the local shop teams' "all stars", it eventually was conceeded that such a "team of local players [would be] reinforced by others from local cities." Though the Middleboro Gazette reported on February 24, 1911, that "a roller polo league ... is about to become a reality", little else was subsequently recorded. A team to include Dalton and Wildes rushers, Higgins center, Hennessy half-back, Clifford goalie and Leighton and Owens subs, was announced though whether it ever was formed is unknown as there appears to be no later record of it. In the absence of formal regional leagues, Middleborough sportsmen established their own roller polo leagues to engage in the sport. These so-called "shop leagues" - leagues consisting of teams formed by various businesses throughout town – became the principal vehicle for promoting and participating in the sport locally. The 1901 league featured “a number of new men … in which considerable confidence is placed, and it is thought that they will prove good poloists.” And, indeed, they seem to have fulfilled their promise. “There were teams representing several firms: Clark & Cole, Leonard and barrows, etc. With ‘Ceph’ Thomas, the most scientific rushing in the league, and Danny McCarthy nearly as good, and ‘Bursie’ Fuller goal tender, the Leonard and Barrows team was well nigh invincible” [McFarlin, 1957]. .Others engaged in the sport, as well. In February, 1901, “a red hot game of polo between two juvenile teams took place in the local rink…. The Everett Streets defeated the Fall Brooks by a score of 9 to 7.” Middleborough High School, at least for a short time, fielded a team [Brockton Times, March 4, 1901], and most unusual of all was competition between ladies' teams, though this appears to have been more of a novelty than an actual pursuit. "The 'Ladies' polo game' in the [American] rink last night between the 'Hartfords' and 'New Havens' was won by the former, 3 to 1. This was the largest crowd present that have attended any polo game this year" [Brockton Times, March 1, 1901]. Despite the fact that roller polo was once the professional winter sport, its local popularity rapidly diminished following the brief revival between 1900 and 1902 for a number of reasons. Ice hockey eventually succeeded roller polo and became the new favorite of the public. The popularity of ice hockey was promoted first, like many sports, through the enthusiasm of Middleborough High School students. In February, 1902, Middleborough High School had a “Tiger ice polo” team and in December of the same year, the class of 1906 formed its own “ice polo” team. Additionally, advances in skate design proved controversial, leading to differences in opinion as to which skates were permissible for play and further encouraging disorganization within the sport. The 1901 Middleborough shop league banned the use of ankle skates – “skates equipped with hinges so that a goal tender could flip them to the side and drop down onto their ‘ankles’. In that way they could boost another player, on regulation skates, all over the place”. [McFarlin, 1957] “The managers of the game in this town do not allow the use of ankle skates, they deeming that it is promotive of anything but good polo” firmly pronounced the league’s managers in 1901. Spectators, at least locally, concurred with the decision, though it seems not to have been one observed elsewhere. The introduction of ankle skates “took all the really beautiful skating and nice work out of the game. 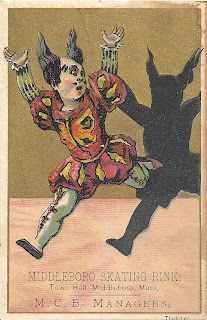 It spoiled the game” [McFarlin, 1957]. Though the revamped rink bolstered hopes for the future of the sport locally, the local shop league became moribund following the departure of the Clark & Cole team which withdrew from it at the start of January, 1902. The profits from the season were distributed among the remaining players, and Leonard & Barrows and the Clerks played a best of five series for a purse of $25 in late February and early March, 1902. It’s not clear when roller polo was last played in Middleborough, though it would seem that it was sometime before World War I. 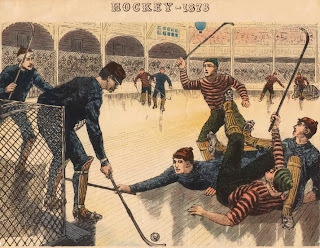 The concurrent rise of new winter sports, including basketball and ice hockey, permanently undermined the community’s previous obsession with roller polo and helped consign the game to oblivion. The rink, located in the auditorium of Middleborough Town Hall was managed by the Middleboro Commercial Band, or M. C. B. as listed upon the card. The illustration depicts a typically aggressive game of roller polo in the late 1870s, just as the game was gaining popularity both locally and nationally. The map is based upon the Sanborn fire insurance map of August, 1885, and shows the location of the Nemasket Rink on Union Street in the rear of Middleborough Town Hall, the site now occupied by a portion of the Town Hall parking lot. Seen in the photograph is Middleborough's most famous roller polo team. Sitting (left to right): Alfred Ellis, point; O. F. ("Muldoon") Smith, second rusher; Edward Menard, first rusher; William R. Jones, half back. Standing (left to right): Michael ("Mike") Curley, goal tender; Dennis D. Sullivan, center. The New York Times, "A Good Roller Polo Game", clipping, December, 1898. 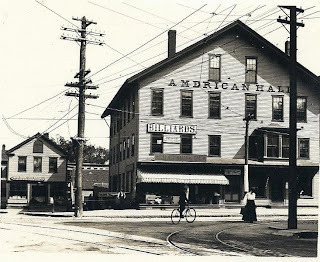 The American Building was constructed during the first half of the 19th century and was later known as the American Hall, taking this name from the large auditorium which occupied its third floor and which served as the main meeting venue in Middleborough prior to construction of the present Town Hall. In 1901, the stage which had hosted numerous lectures and events over the previous sixty years was removed in order to expand the roller polo rink, then known as the American Rink. Still later, the space was used as a movie house. 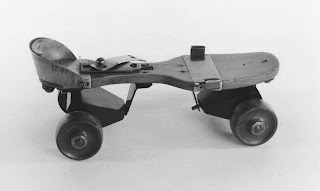 The Plimpton skate with its four wheels and ability to turn was invented in 1863, revolutionizing roller skating and making possible the sport of roller polo. The continual evolution in skate design, however, would promote confusion within the sport and contribute to its decline. Boston Daily Globe, February 23, 1901; February 28, 1901; November 26, 1901; "Opening of Polo Season Hailed with Delight", December 1, 1901; December 5, 1901; December 10, 1901; December 12, 1901; December 19, 1901; January 9, 1902; January 12, 1902; January 16, 1902; January 22, 1902; Janaury 27, 1902; February 13, 1902; February 20, 1902. Brockton Times, "May Have a New Rink", August 2, 1900; "Middleboro", January 1, 1901; ibid., March 1, 1901; ibid., March 4, 1901. Grace Clark ["Eve Lynn"], "Battered in Roller Polo Game", Middleboro Gazette, December 1, 1960, p. 9. James H. Creedon, "Roller Polo Era Recalled", Brockton Enterprise, January 5, 1952. James H. Creedon, "Roller Polo Days Recalled", Brockton Enterprise, May 28, 1953. Keith Hodgdon, "Wild Bill Who? The Country's Best What? ", Sports Illustrated, December 4, 1972. Sampson McFarlin, "Letters to the Editor: Rollo Polo", Middleboro Gazette, October 3, 1957, p. 2. Middleboro Gazette, "Middleboro", January 20, 1911:4; ibid., January 27, 1911:4; ibid., February 24, 1911:4; "Meeting of Former Polo Players", January 31, 1913:9; "What the Gazette Was Saying Twenty Five Years Ago", November 5, 1920:7; ibid., January 7, 1921:6; ibid., November 23, 1923:6; ibid., December 14, 1923:8; ibid., January 18, 1924:7; "Old Middleborough", September 12, 1924:1; "What the Gazette Was Saying Twenty Five Years Ago", November 14, 1924:7; ibid., November 28, 1924:6; ibid., November 6, 1925:6; ibid., December 2, 1927:6. The New York Times, "A Good Roller Polo Game", December, 1898; "Well-Known Polo Player Dead", January 14, 1899. Thank you for your post. It is super informative. I learned a lot from it.